My inspiration, as small as it may seem, for today’s meal was a box of mushrooms. Some mushrooms just say to me “I want to be chopped up in little bits and eaten in a salad.” Some of them say “I want to be sliced thin and made into a soup.” And these mushrooms that you see here, they were jumping up and down, screaming to be made into stuffed mushrooms as loud as they could! Honestly, I don’t understand how everyone else in the grocery store wasn’t annoyed by all the ruckus. On a slightly more serious note: I saw these mushrooms and was instantly and immediately inspired to make stuffed mushrooms with them. Unlike bursting in to song, stuffed mushrooms take some preparation, consideration, and planning. I knew that they wanted to be made in to stuffed mushrooms, but I still had to figure out what to stuff them with! Not to worry; it came to me. Or, rather, my wife and I spent an agonizing 30 minutes spit-balling ideas back and forth until one stuck. Like inspiration, I knew it once we had it. So, here it is! 1 medium Rutabaga, finely chopped. 1. Cook and crumble the bacon. Drain the pan of most of the bacon grease (to be used in some other culinary creation!). 2. Add the onions and rutabaga to the remainder of the bacon grease and begin cooking on medium heat. Stir regularly (every 1-2 minutes). Remove the stem, cut out the lip, and scrape out the gills. 3. Remove the stems of the mushrooms, cut out the lip of the cup, then scrape the gills off the inside of the cup (or cap, if you’re using caps) of the mushroom with a spoon. This makes more room for the stuffing. Note: Don’t know what the gills are? Check here. 4. After about 10 minutes of cook time, add the garlic and mushroom stems to the onions and rutabaga and continue to cook and stir for another 5 minutes, or until the onions are thoroughly caramelized. 5. Turn off the heat, add the spices and diced basil and mix thoroughly. Stir in the spices and basil with the caramelized onions and rutabaga. 6. Pre-heat the oven to 350. 7. Spoon some stuffing in to each mushroom, making sure that they’re filled to the top, but not over filled. The mushrooms will shrink while baking. Don’t over-fill the mushrooms; they shrink while baking. 8. Grease the bottom of each mushroom thoroughly (yes, you can use the bacon grease 🙂 ) and place the mushrooms in a baking pan with enough space between them so that they’re not touching. 9. Put the pan in the oven once it’s up to temperature; set the timer for 15 minutes. 10. When the timer dings, sprinkle the remaining diced basil on top of the mushrooms, and serve and enjoy! Optional: If you’re a cheese person: you can add cheese to the recipe at the end, while you’re adding the basil and spices to the stuffing. What kinds of inspiration strikes you? Do you ever have inspiration that you can act on immediately? Do you? Do you ever have food inspiration? 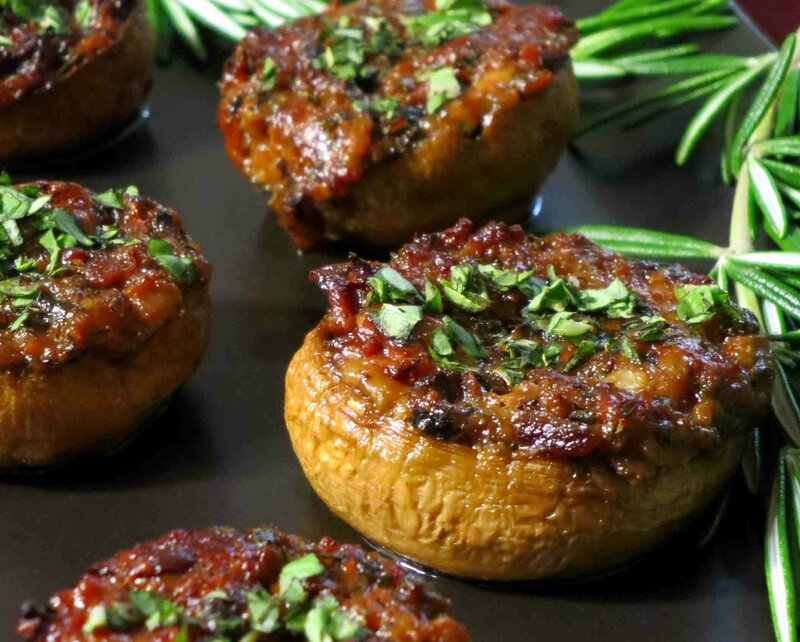 How would you use this stuffed mushroom recipe? How might you change it to suit your needs? Are there other stuffed mushroom recipes that you like? Would you serve this as a meal, or an appetizer? My late Grandpa loved making those on special occasions like Birthday and Chinese New Year. He used fragrant mushroom (black mushroom/ shitake), stuffed them with seasoned, minced shrimps and steamed them. Maybe it’s time to try now! I’ll likely do shrimp the next time – the bacon seared shrimp, or the pepper shrimp recipes I’ve done would both be great as stuffed-mushrooms! I like them baked far too much to steam them! I think I should try to bake them! If you want to try it, it’s pretty simple. Mince the shrimp. Season it with sesame oil, finely chopped garlic, ginger, scallion, cilantro, salt and pepper and then stuff it into the black mushrooms. Steam it and serve it with sweet chili sauce. Sear the shrimp in bacon grease, mince it. Boil rutabaga with coconut cream, mash it like a mashed potato. Dice the mushroom stems and quick-cook them with your spices. Combine shrimp, mushroom, and rutabaga with your spices. Stuff the Mushrooms and bake them. I’ve got to get me some of these black mushrooms – they sound great! Do you know what the actual name for the mushroom is? I don’t think I’ve ever seen anything like them here; so I would have to go looking at some of the Asian markets around. Maybe I’ll get lucky… Otherwise I have to try ordering online. The Chinese people call it Xiang Gu (Fragrant Mushroom). The Japanese call it Shiitake. I think it is more popular with the name Black Mushroom because of its dark, velvety cap. No kidding! We get Shiitake here, but they have no cup – they’re a flat-cap mushroom here. I could just pile some stuff onto the cap and serve it that way, but without the cup it’s hardly a “stuffed” mushroom… Maybe I’ll find something different at the Asian market – there are a few good ones nearby. There are several sub-types of shiitake. Even in such a small town like the one I live in, there are 2 types (the black one and the floral one). ohh these look great!! I’ve never made stuffed mushrooms. they always looked so complicated!! haha maybe i’m just a lazy cook. my birthday party is next week and I think these would be good for me and the non-paleo crowd. they always try my cooking and if it tastes as good as these look, then I think they will go pretty fast. Welcome JoannaBanana! You’re in luck! This recipe is a bit time consuming, but super easy and every bit as good as it looks! Also – you can make 3 or 4 batches (or more if you have lots of guests), store them in the fridge (before baking them) and put a batch in the oven every 20 or 30 minutes or so to keep the food ready and restocked all night! cool!! i had no clue what a rutabaga was. luckily my grocery store labels the veggies and i found this one. definitely not what i thought it looked like haha this will be good for appetizers but i will probably make a meal out of it. my family never makes paleo food for any party so i usually eat tons of what i end up making. the kitchen is way too busy for me to make some elaborate main dish.